Marvel’s Captain America is a paragon of virtue and righteousness who fights for the American ideals of truth, justice, and liberty against the totalitarian socialism of the dictatorial Left. But somehow his message is lost on liberals. The movie “Captain America: The Winter Soldier” was an incredible story of how evil infiltrates, corrupts, and destroys even the most righteous organization. They did it to the Catholic Church in the Dark Ages bringing about the Schism and then the Inquisition, both in direct conflict with the teachings of Christ. Pope’s became militant as their ecumenical orders became populated over the centuries by the dispossessed sons of nobles rather than the pure of spirit seeking a godly life. It took the Gutenberg Bible and the Reformation to take Christianity back to Christ. Every generation faces evil and must wage a new battle in the eternal war for the soul. It’s tough to fight for right to have a better life and easier to just remain ignorant and not learn morality but just go with the flow. But contrary to leftist ideology ignorance is not bliss, teachers are not those who fail in life, and wealth is not acquired by stealing from others. The beliefs of the leftist that socialist tyranny, wherein the masses are all equal and serve the elites who maintain the status quo, is an ideology that allows no one to rise through the gifts that God has bestowed upon them. Leftists will use propaganda to say that their intention is to make a better life for everyone presents the lie by which they seduce the foolish, the lazy, and the ignorant. For example, their commercial of an illegal alien who works in the fields, goes to school, and eventually becomes a medical professional. 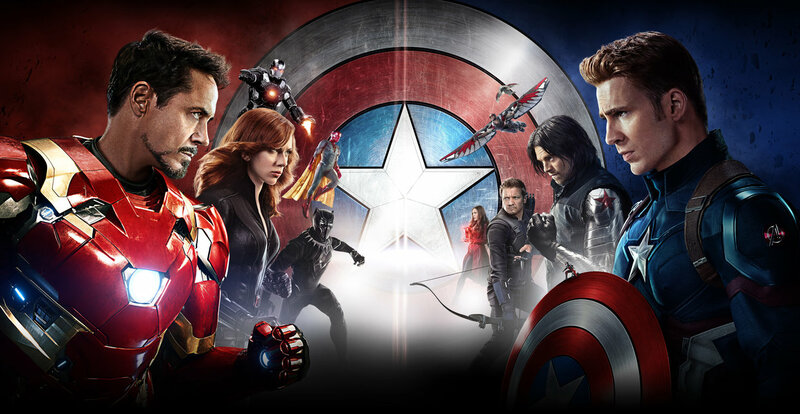 “Captain America: Civil War” is about the conflict today between Americanism vs. Globalism. (Movies are often morality plays about current culture and politics. Being in control of most of the media, Hollywood, and entertainment the Left often uses it as a venue from which to propagandize the viewing public. e.g. TV’s “Madame Secretary” being a vehicle for advancing how Democrats and a female leader can make the world a better place by successfully fighting to save the planet from global warming and other such leftist scams). In CA:CW the Avengers are told by the World Court under UN sanction that they are more of a danger to the people than the evils they fight because of the destruction that is wrought in the conflict. So the UN wants control over the Avengers to decide who and how they fight. The UN today has become a corrupt organization of the world’s petty dictatorships being led by the socialist totalitarian powers that America spent the 20th century fighting against. Why would the Avengers, or America, submit to their rule? The liberal’s take on Superheroes has devolved and corrupted them over the years. This is mostly because Hollywood is a subservient crony to Washington corruption over which Democrats have presided for the last century. Superman in DC Comics declared he no longer stands for “Truth, Justice, and the American Way,” but as an “illegal alien” he stands for all as a “citizen of the world.” So the Superman who helped fight the Nazis and Imperialist Japan in WWII, and fought the Communists in Europe to lift the Iron Curtain and stop them in Asia from enslaving other nations, now cannot tell the difference between Islam and Christianity. This foolish liberal writer’s understanding of Captain America saving Bucky confuses the difference between his extreme tortures to hijack his mind with the brainwashing to mislead jihadis who choose to commit murders. Liberals today call what is normal “extreme” because they have no ability to understand the fine line between being misled from ignorance and actively choosing to follow what you know to be morally wrong. Everyone knows murder is wrong, but leftists can justify any level of violence to promote their ideology because socialists are the world’s fascists. They lack the moral compass to see the difference between murder and killing in self-defense. Leftists say fighting jihadis breeds more jihadis, which is like saying fighting crime breeds more criminals. Just because a Moslem joins the Jihad because he suffered a loss is no different than those who join the Mob because they suffered a crime. Justifying the murders they commit because they suffered has no basis in righteousness. Attacking the innocent does not right a wrong but makes two wrongs. And these people using the excuse of history are morally twisted. Such people will go back in history to the lifetimes of others to justify their actions, but there is no one who is responsible for what they do other than themselves. This is the lesson Jesus taught. The problem with Islam is that Muhammad taught the opposite, then forced them to submit to their Imams in all things, and that is what makes Islam an evil death cult. The linked article below was written by a young liberal on SyFy Wire about “Captain America: Civil War” completely misses the moral lessons being taught. There are still some script writers, directors, and producers who have not been corrupted by the Left and produce righteous moral stories. If you have a moral compass you can see the difference and spot the leftist propaganda they attempt to inject subliminally (like Spock in Star Trek: The Undiscovered Country referring to the most warlike elements in the Klingon Empire as “conservatives.”) She believes the story is all about a timely Marvel production changing the righteous all-American Captain into a rebel right at the time the evil fascist bully Trump has taken over America. She apparently didn’t pay attention to the fact that Steve Rogers is standing up for Truth, Justice, and the American Way against the UN that Ironman is supporting that wants to take charge over the Avengers. Clearly she doesn’t get it when Obama, who says America is the source of evil in the world as the Communists, Islamists, and all the third world dictatorial toilets in the UN say, that she does not stand with America. Is it any wonder that Obama, the Moslem Trojan Horse that Americans foolishly elected to be leader of the free world, who weakened America and unleashed the Jihad on the world again, now wants to be Secretary General of the UN to stomp out American influence in the world? America and Captain America fought leftists throughout the 20th century. Now the leftists are saying America is the fascism that must be fought. They do not recognize that they are voting for that fascism in the Democrat Party and that Republicans are the scapegoat. It is unfortunate that many in the Republican Party are willing to join with Democrat corruption rather than fight against it, and that confusion extends to those who stand against Trump’s efforts to bring down Washington corruption. Is it any wonder that half of Americans who could vote have become frustrated and discouraged that anything can be changed making them apathetic? It would be a great tragedy for America’s Superheroes to take up cause with those evil regimes in the world that are anti-American. America has pushed back against the forces of corruption and still stands for liberty. President Donald Trump, whom the Left is trying to portray as Hitler in their endeavors to obscure the truth that they are the fascists, now represents what may be the last opportunity to turn America away from the darkness and back to the Light. The powers of fascism have been beaten back, not embraced! Believing that Trump is only for enriching and empowering himself and the 1% and do nothing for the people before he even has a chance to prove himself is one more prime example of how leftists are the bigots and how backwards liberals think. This entry was posted in Fundamentals, Politics and tagged America, Americanism vs. Globalism, Avengers, Campus riots, Captain America, Captain America: Civil War, Captain America: The Winter Soldier, Christianity vs. Islam, Democratic socialists, Donald Trump, Fascism, Freedom of Speech, Leftists subvert heroes, Liberalism, Social Justice, Socialism, Superheroes. Bookmark the permalink.